The successful comedic revitalisation of crime TV series 21 Jump Street back in 2012 caught everyone by surprise, particularly because everyone had assumed it would be dead on arrival before even seeing it. Obviously it wasn’t, but the shared cynicism managed to return when a sequel – aptly named 22 Jump Street – was announced, despite the same creative team and cast coming back for it. Now, if there’s one thing we’ve learned from directors Phil Lord and Chris Miller, it’s to NEVER underestimate their line of work. Believe it or not, there were actually people who thought Cloudy with a Chance of Meatballs and even The LEGO Movie would seriously underwhelm and look how they turned out, especially the latter. 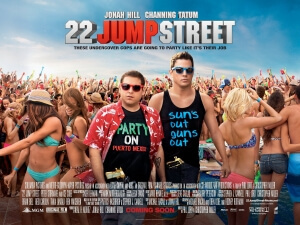 With 22 Jump Street, the public negativity once again works to its advantage and manages to bring something fresh and new to the table while also retaining everything that made its predecessor work. In some sense, 22 is almost a direct clone of 21 in terms of plot beats which for some sequels (i.e. The Hangover Part 2, Home Alone 2: Lost In New York et al) could spell the kiss of death. But thanks to the incessant amount of self-referential humour that admits upfront about its re-trodden path countless times, as well as frequent boasts of an increased budget and a priceless end-credits gag about the ugly sides of franchising, it constantly feels fresh and never redundant. Once more, Lord and Miller play with our expectations of a major movie sequel and both gives us exactly what we are dreading/expecting whilst also something unexpected and more than worth the price of admission. The power of duos ultimately carries this film, with Lord and Miller behind the camera as well as Jonah Hill and Channing Tatum in front of it. Hill and Tatum go to new lengths with their on-screen bromance, heavily playing up the homoeroticism as in other buddy cop action movies and treating it like a normal long-term couple, complete with the revelation that Tatum eventually wants to “investigate other people”. Some particularly impressive instances of split-screen also work well into the shared bond they have for one another, and show their differences but also their strange personal connections which oddly enough make them one of the most engaging on-screen duos in a long while. The amped-up bromance is made all the more believable thanks to their unique chemistry and perfect composition. Tatum in particular is given a sizeable amount of space to flex his comedic muscles, even more so than in the first film, and as before runs off with the entire movie in addition to getting some of the film’s biggest laughs (his reaction to a certain revelation involving Hill and love interest Amber Stevens, a hilarious reveal in and of itself, brings down the house). His ability to be both funny, charming and all-round committed to whatever is thrown at him to develop comedy is unsubstantial, and all the more impressive when you realise he’s just as good in more dramatic roles such as Side Effects or the forthcoming Foxcatcher. Likewise, Ice Cube is given an expanded role after his scene-stealing turn as the anger-prone police captain and never fails to raise huge laughs with his one-liners or sometimes even his facial expressions. It’s a comforting role for him to play after the disastrous Ride Along. As a comedy, 22 Jump Street is heavy on laughs and character to ensure multiple viewings. As a comedy sequel, it works even better with its meta referencing, especially surrounding its identity as an obvious rehash of the first film and as part of the current Hollywood system of spurning out sequel after sequel (highlighted in that ace end-credits sequence. Seriously, don’t leave after they start; you won’t regret it).